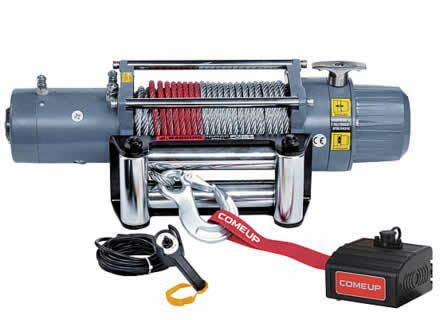 The Comeup Recovery Winches are equipped with a heavy duty motor which delivers superior torque output for self-recovery or utility duty automotive applications. The Self-Recovery range (DV9i – DV6000S) provides the maximum line pull capacity from 4,800kg to 6,800kg and are all featuring the strongest power for working in off road environments. The Utility Duty Winch series (DV2500i – DV4500i) are designed to be used as a trailer winch; providing a line pull of up to 2,000kg. They are dexterous, easy to install and the high torque permanent magnet motor delivers high line pull at lower amp draw. Automatic load-holding mechanical failsafe brake ensures strength and reliability. Three stage planetary gearbox delivers the most reliable and durable performance of winch under tough weather conditions. Turn clutch by ergonomic T-handle for rapid rope payo The equally positioned pin holes make it easy to rotate by 36° or 40° increments for special in-bumper applications. Specific design of brake (CBS) outside the drum is ideally suited to heat-sensitive synthetic rope. 12 & 24 Volt reversible motor. Tough weather resistant housing with integrated solenoid pack. Built-in mechanical safety braking device. Remote control with 3m cable.